Gasholder. To by a gas tank, heating, gas holder, independent gasification, gas holder. Home>Articles>Gasholder – what is this? Gasholder for cottage, gasholder for summer house, independent gasholder – what are they? Why «heating» and «gasholder» are the synonyms in people conversation discussing country house construction project? 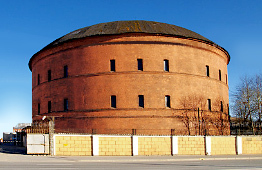 What’s common between modern gasholder and high cylindrical buildings (tanks) of the factory constructed in 1856 on the count Rasumovsky's manor to supply the heart of Moscow with gas? Or with pre-revolutionary surviving gasholder on Obvodny channel in St.Petersburg? Why the stylized picture of gasholder is shining on Salavat city flag and its emblem? Nowaday gasholders are quit differ from their predecessors, watching on them «as beneath». What does modern gasholders look like in the independent gasification? Gasholder is a special tank to store liquified petroleum gas, and piping system to supply it to the customer. 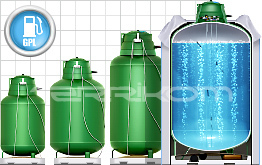 Universal liquified petroleum gas is used for heating, cooking, water heating, electric energy generation, and equipment and systems functioning, which make our life more comfortable and convenience. Gasholder – is a very important element in independent gasification system; to buy it is to gain a saving comfort. Gasholder – is an appliance with an input safety which is assured by leakage signaling sensors, earth system, and absence of high pressure. Gasholder is a heart of independent gas-supply system for summer house, private house and cottage.